At California Sofa you can change the length and depth of any sofa or sectional to the inch. Additionally, you can adjust the arm height, arm width as well as the back height and seat height. We have over 2500 different fabrics and colors to choose from. There are different grades of fabrics which will determine price. The fabrics range from polyesters, micro suede to linen. We also offer a faux leather option. The most durable fabrics are the microfiber or micro suede. Typically, the microfiber/micro suede option is a great choice for kids and pets. We have a very extensive Italian leather selection with a wide variety of colors. Most of our models can be made in leather. We use kiln dried solid alder wood and sinuous “no sag” springs. We also offer a pocketed coil option for the seats as well as a variety of down for the seats and back cushions. The most popular down option is a synthetic down which is hypo allergenic. We use a 2.0 lb density foam. There are three levels of firmness ranging from soft, medium to firm. 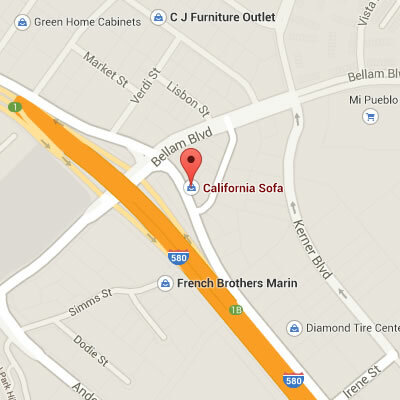 At California Sofa you can add a twin, full, or queen size sleeper to most of our sofas and sectionals. We offer three different options ranging from a deluxe pillow top innerspring mattress, a Air Dream mattress (like the Sleep Number beds), and a memory foam option. From the time the order is placed to delivery is 2 – 3 weeks. At California Sofa, we offer a lifetime warranty for the frame. 2-year warranty on the foam cores.